May 24, 2014 is the worldwide date for the March Against Monsanto. 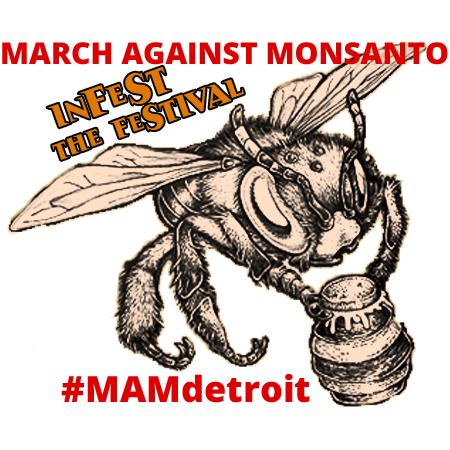 Here in Detroit we’ll be gathering at Grand Circus Park and making a visit near the admission gates to Movement Festival. Our intent is to have a fun creative performance to attract attention and offer materials that seed the crowd and festival with anti-GMO information. The world isn’t right when most of the food has been tampered with and is causing illness. Seeds of life are being patented and mutated. Around the world people are standing up demanding food sovereignty. We have to request dignity as more than walking laboratory experiments ingesting food and pharmaceutical cocktails. 10am - Gathering in Grand Circus Park (GCP) at Woodward & Adams. Details regarding performance activities and distribution of materials will be taking place. 10:45 - Gather at the Hazen Pingree memorial statue in GCP to hear about Detroit’s agricultural history. 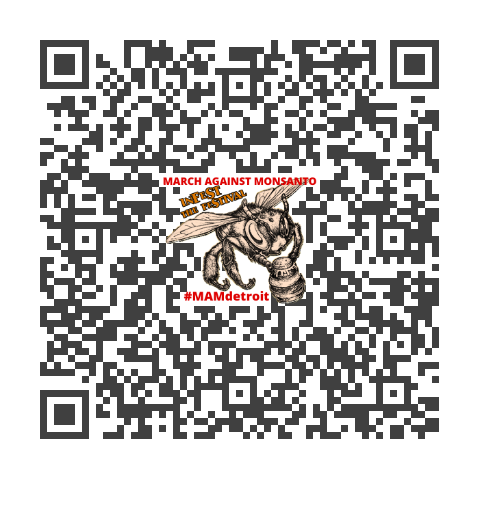 approx 11:20 - arrive at Jefferson Ave for performance activity and distribution of anti-GMO information to Movement Festival goers who will be waiting outside the admission gate at Hart Plaza. 12:15 - Head toward Cobo Hall down Jefferson then a right on Washington Blvd headed to GCP. Those who can’t make the walk can take the People Mover from Cobo Hall to GCP exit. Once back at GCP we’ll discuss more topics and wind down the march. Dress as a bumble bee and participate in the performance! Posters and banners with anti-GMO messaging, topics about food sovereignty, info on the Trans Pacific Partnership (TPP) agreement, etc. Water during the march - avoid plastic bottles, use a metal canteen! For a GREEN new world we have to be wise consumers. Print sticker sheets of QR codes for distribution - prefer not inkjet copies as they will run in moisture. Regular B&W copies will work. Donations at http://rally.org/mamdetroit - funds used for printing & publicity expenses of the event. Previous Post“Monsanto’s basic problem will fortunately always be driven by the unavoidable fact that the most…”Next PostAre you Ready to March on Saturday?